Seriously, did you read that whiney drivel from yesterday? ( Here ) Some folks really just should keep their mouths closed and their fingers off the keyboard because all they do is show, literally, how lacking in brains and imagination they are. It was so mortifying to be a part of that conversation and I was just the tool! Over the last two days, I have been dropped, poked, prodded, and plugged into electrical outlets and some gismo in the car. And I have no idea of the number of miles I have traveled and the places I have seen. But I digress . . . back to the beginning. I was relieved. Safe! Or at least for the moment. My happiness lasted for less than a minute because she was back, grabbing me as she put Louise back in her place on the shelf. Drat . . .white is not the “in” color! So then I was prodded wide awake – no more yawning, plugged in to charge up, coded so I could be connected to the World Wide Web (www – in case you had forgotten) and, in general, treated so informally that I wanted to ask, “What am I, chopped liver?” but I didn’t want to take any words from anyone else’s mouth! Chatter, chatter, chatter but what I really heard was blah, blah, blah! So, this app transferred a bunch of apps and pictures so I’m now quite a cluttery mess and then she (my new owner) said, “I don’t think I have all my pictures. And what about Twitter? And where is my Voxer icon? She’s got it rough. Pictures? Twitter? Voxer? She thinks she has worries! Right before we went out the door, I heard her say that she would bring all her questions back when the new screen protector came in. PUL-E-E-A-A-S-S-E-E! Maybe I could convince her that I was just TOO much phone for her! AHA! What fun for me! So I spent the last two days as a trickster. Sometimes I worked on command. And sometimes I didn’t work on command. I quickly learned how to avoid being yelled at. There were a couple of choice words that I really did NOT like to hear. So today we’re back in the store. Me – No, she’ll forget because she’s old and forgetful. She only has one or two passwords memorized. Me – Tedious? BORING! Case closed – whiney drivel! Which version was more realistic? Which version was more fun? Is it possible that there is a third or even a fourth version? PS. Check out how handsome I am! I could have been one of these old dinosaurs! Process: As I finished writing yesterday’s post, this author began to wonder if the story could be told from another point of view. She had revisited the two versions of the deer story that was quite popular last March here and here and wondered what could lend itself to that same CCR. A. R. 6 Point of View standard. What do you think? The post was drafted in 15 minutes. The picture from yesterday was recycled with another quick search for a talk bubble. Preview, categories, tagged, and ready to publish but oh, wait, a quick check for pictures of old, old, old phones! It’s early morning. I am not yet ready for conversation. Please, just one cup of coffee. Is that too much to ask? Yes, I am a morning person. But I am a peaceful, quiet morning person with rituals and routines that begin the day calmly and quietly and without any fuss and especially so on a Sunday! Here I sit with my coffee and I’m rewarded with her sweet, gentle kiss. And then she races to the door, tail wagging and snuffling – quietly letting me know that she is ready to head outside. She is ready to begin the day with her first outside excursion. What sounds does Mya make? The answer seems so simple. When she is in the house, she barks to herald arrivals. She barks and barks as a vehicle pulls into the driveway, as a driver exits the car, and until that knock on the door is answered. When she is outside, Mya barks to share her excitement with me when she finds something outside that I need to see. She barks when another critter (but not the familiar deer) invades her space. But she also hums when I rub her belly, or cries out when dreaming, or that bit of an attention-getting sigh when ignored too long. However, this morning Mya quietly goes outside to check out the sunshine and someone who is not working on a computer. Which is your focus? Product / Process / or both? When does the priority of your focus shift? Or does it? Check out Margaret’s comparison of writing to watercolor painting in her post “Technique” ! 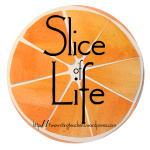 DigiLit Sunday and Slice of Life!